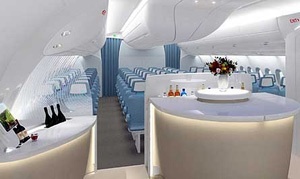 A350 XWB News: BMW interior for the A350 XWB … 7 years ago. 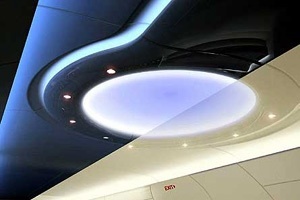 At the 2006 Aircraft Interiors Expo in Hamburg, Airbus showed a mockup of an A350 interior designed by BMW Designworks. 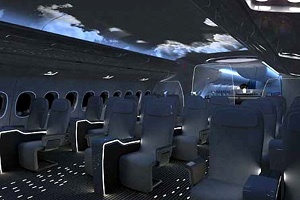 The stylish cabin has some interesting features which are designed to relax the passengers and save space. There is also a cool mood lighting feature which can project images like the night sky or clouds onto the ceiling. “In the entrance area there is a dome that gives us the feeling of spaciousness and openness in the cabin and configured for whatever mood you want to generate,” said engineer Dougie Hunter. That looks just amazing! Nice pics. Didn't know BMW were capable of this. It all looks very futuristic despite being made 7 years ago.